We live in an internet-connected society that increasingly relies on computers and the internet. And you know there’s one more thing that relies on the internet; suffice to say, feeds on the internet – viruses! Attacks on computers have become a much bigger concern these days, especially with thousands of malicious programs surfacing every day. There are over thousands of different computer viruses, Trojans, and malicious internet programs that are responsible for invading our computer system. Obviously we want our computers to be protected and secured against these so-called computer viruses. This is why we have security systems such as antivirus programs in place to deal with these threats. Antivirus software programs are still the most recommended solution when it comes to viruses. But with an abundance of antivirus programs out there, it’s hard to choose the best. We look at two of the most popular antivirus programs – McAfee and Windows Defender – and see how they compare. McAfee, LLC is a global security company and one of the renowned names in the antivirus business. Named after its founder John McAfee, who founded the company in 1987, the company has seen its fair share of ups and downs since it originally started as McAfee Associates. By the end of the 1980s, the company started gaining momentum and it wasn’t until the Michelangelo virus – one of the deadliest computer viruses designed to affect DOS systems – wreaked havoc in the late 1990s that people started to understand the need of antivirus programs and McAfee rise to fame soon. Thanks to Michelangelo virus, McAfee became a go-to cyber solution and eventually became a multimillion dollar business overnight. The company is now part of the Intel Security division after Intel purchased McAfee in 2011. Windows Defender is the Microsoft proprietary antivirus and malware protection program which is a fully integrated part of the Windows 8/8.1/10 operating system. It was initially introduced as an anti-spyware protection tool for Windows XP and when Windows Vista was released in 2007, it came pre-built as part of the operating system’s security suite being formerly known as Microsoft AntiSpyware. Windows Defender offers real-time protection from spyware and other malicious programs and unwanted software. It can also be configured so that it can scan for spyware on a regular basis rather than periodically. You can also configure Windows Defender to manually check for updates using Windows Update. Like other antivirus programs, Windows Defender relies on virus definitions which help determine whether a file contains spyware and they need to be updated every now and then for complete protection. – McAfee, LLC is a global security company headquartered in Santa Clara, California and one of the renowned names in the antivirus business. McAfee is the go-to security solution for individuals and businesses alike looking for all-around protection against all kinds of computer viruses, Trojans, malware, spyware, and other malicious programs. McAfee is part of the Intel Security division now after Intel bought McAfee in 2011. Formerly known as Microsoft Security Essentials, Windows Defender is the Microsoft proprietary antivirus and malware protection program which is a fully integrated part of the Windows 8/8.1/10 operating system. – Protection is one of the key factors in deciding the right and most reliable antivirus program and its ability to safeguard your computers. With insufficient security and a not-so-reliable antivirus program, your computer can be as vulnerable as the internet itself. McAfee, as a full-fledge antivirus software, seems to be better suited for all-around security as it provides advanced security solutions to better protect your system from all kinds of threats. Plus it offers better malware protection than many other antivirus programs out there. 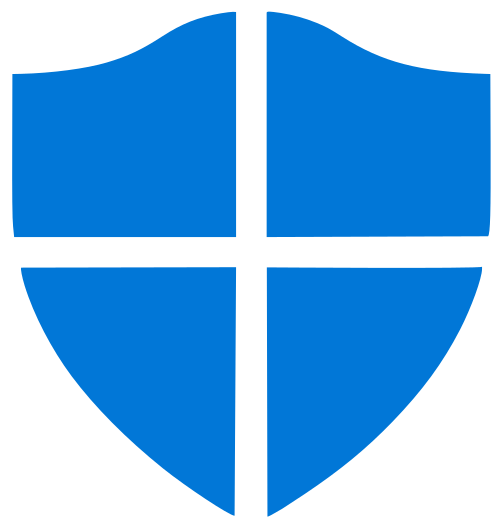 Windows Defender is the Windows’ built-in antimalware program with real-time malware protection enabled by default. – On-demand virus scans have adverse effects on the performance of the system and McAfee’s security suites of antivirus programs are no exception. McAfee is not as memory efficient as other antivirus programs because it consumes resources while scanning for threats eventually affecting system performance significantly. However, McAfee VirusScan Enterprise edition is designed to have a very less impact on the system performance in terms of resource usage. Windows Defender, on the other hand, is a built-in program which puts more impact on system performance than McAfee in terms of memory management and resource usage. – As Windows Defender is a fully integrated part of the Windows 8/8.1/10 operating system which comes pre-built as part of the Windows antimalware and antispyware tool, it does not cost you a dime. Anyone with a Windows PC or laptop has free access to Windows Defender which reviews for malicious files regularly during scheduled scanning. McAfee, on the other hand, provides a sizable software suite of antivirus and antimalware programs that are available to users on a paid subscription basis both monthly and yearly. In fact, all the McAfee’s antivirus suite and plans are paid-for based on requirements. So, Windows Defender is the clear winner when it comes to pricing. With an abundance of choices when it comes to choosing the most reliable antivirus program, it’s hard to choose from so many options. Similarly, the decision can be a little tricky when choosing between the two most trusted antivirus programs, McAfee and Windows Defender. McAfee, considering its long running history, is a powerful contender in the security business and one of the most trusted as well. However, Windows Defender, being probably the only pre-installed antivirus program on Windows operating system, is actually equally reliable and efficient in terms of security and protection, plus it’s not as memory hungry as McAfee and on top of it, it’s absolutely free. Sagar Khillar. "Difference Between McAfee and Windows Defender." DifferenceBetween.net. 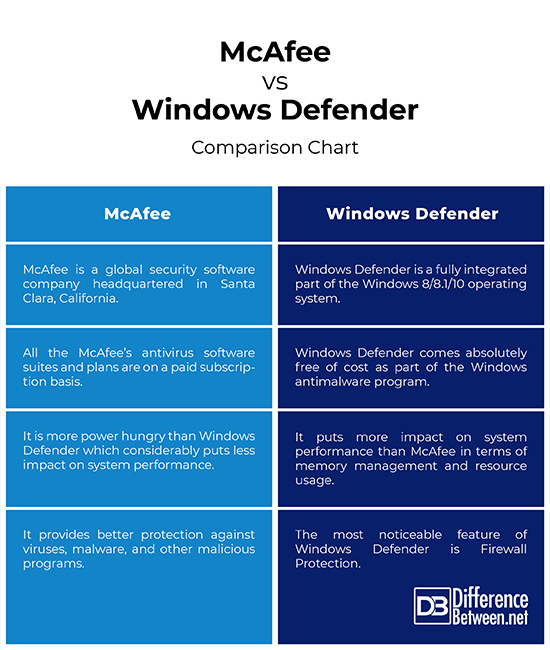 March 5, 2019 < http://www.differencebetween.net/technology/difference-between-mcafee-and-windows-defender/ >.